Widespread sharing of ideas for birthday cupcakes occurred due to a recent surge in cupcake popularity. Since cupcakes are baked as single servings, they're an excellent choice for birthdays, and they can be decorated in fun and interesting ways, just as a big cake can. In addition, it's easier to tailor cupcakes to the preferences of birthday guests than it is to tailor a big cake, since you can mix up two or three small batches of cake batter and make several different kinds of cupcakes at once. When you're making cupcakes for someone's birthday, keep that person's favorite things in mind. With a little creativity and planning, you may be able to turn the celebrant's favorite activities or hobbies into a unique and interesting set of cupcakes. Animal cupcakes are a perennial favorite with kids and adults alike. You can bake animal cookies and stick them on top of cupcakes, decorate cupcakes with animal crackers, form animal faces or figures with fondant, or use buttercream frosting to pipe animal shapes onto the cupcakes. 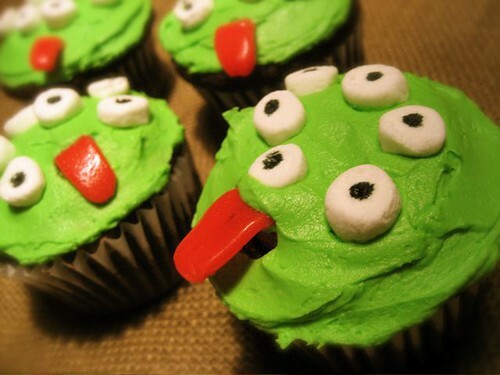 A more whimsical variation is to whip up a batch of bright green frosting and use it to make monster or alien cupcakes. Karen Tack and Alan Richardson's book, Hello Cupcake!, is full of creative animal designs, including shark cupcakes. Make your cupcakes fit the theme of a birthday party by decorating them with small balloons or frosting your cupcakes in different colors and stringing them together like balloons. In keeping with the party theme, you could also top cupcakes with small fondant party hats, tiny birthday cakes, or piñatas. Another idea for a party with a lot of guests is to bake a big rectangular sheet cake, ice it as usual, pipe a border around it, and set several cupcakes on top. Tailor the cupcakes you make to the birthday person's most unique traits. If you're baking for a boy who loves video games, for example, you can use colored fondant to create game controllers and other game-related props and place them on top of iced cupcakes. For someone who likes sports, decorate a series of cupcakes as soccer balls, basketballs, baseballs, footballs, and tennis balls. If you're decorating cupcakes for someone who loves fashion, you can design tiny clothing items and accessories to place on the finished cupcakes. For an adult's birthday party, you may be more focused on the flavor and overall appearance of the cupcakes instead of on ideas for decorating birthday cupcakes with bright colors or catchy designs. 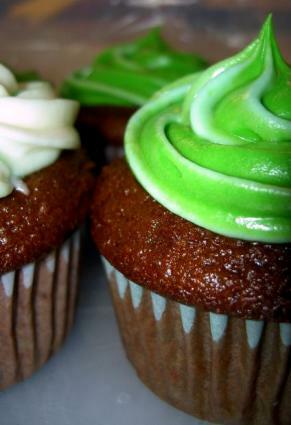 In those cases, a unique flavor such as green tea cupcakes may be a good choice. You can decorate the cupcakes simply, with light green frosting and small fondant flowers, and present them in a cupcake stand or cupcake tree. You could also ask the birthday person for a favorite cake recipe and adapt the recipe for cupcakes instead, opting to decorate them with just a thin layer of frosting so that the cake flavor is what shines through most. Decorating with fresh flowers is also a nice touch. Of course, it's still fun to bring colorful and creative cupcakes to an adult's birthday party, so you shouldn't hold back with decoration ideas just because you're making cupcakes for someone past childhood. 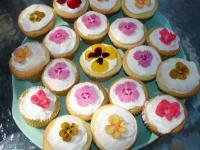 Embrace the artistic side of cake decorating, and use it to make cupcakes that truly fit the occasion.